Originally, Scarborough was served by seven separate fire companies, all formed after 1914, serving Oak Hill, Dunstan Corner, Pleasant Hill, Pine Point, North Scarborough, Black Point and Prouts Neck. The latter two merged in the 1960s, leaving the six current call companies. Each fire house had its own chief, and they were all led by the chairman of the Board of Selectmen, who also wore the white hat of the fire chief. But the real power was wielded by the president of the Scarborough Fireman’s Association. Things changed in 1948 when seven companies joined as a single administrative unit under the town’s first official fire chief, Ralph Bennett. The merger was driven largely by the growing number of calls – an astounding 257 that year. The year before that merger, in 1947, the town got its first dispatch center of a sort, with Elizabeth Libby and her daughter, Shirley, manning a red emergency phone and a makeshift switchboard located in the hallway between their home and the family-run Newcomb store. In those days before 911, or even local telephone exchanges, you reported an emergency by asking the operator for “Tuxedo 4542.” By 1962 the Libbys were collecting $1,200 a year for their services. That’s $9,282 in today’s dollars – not bad work if you can get it. By the time Scarborough got its first full-time fire chief, Eldred Harmon, in 1973, annual emergency calls had more than doubled, to 576. In the meantime, Scarborough became the first Maine town to have an actual rescue squad. Founded in 1951 by Dr. Philip J. Haigis – you’ve probably driven on the parkway that bears his name – the unit boasted a 20-man volunteer crew within its first year of operation, including a carpenter, a bus driver, the town postmaster, a physician and a deputy U.S. marshal. The town’s first rescue unit was a new 1952 Chevy panel truck, purchased by the local Lion’s Club for $3,000 – that’s $26,953 in 2013 dollars, so still a bargain compared to the $170,500 set aside for a new unit in Scarborough’s current budget. According to a 1954 interview with Haigis, formation of the rescue squad was prompted by four drowning deaths on Scarborough beaches in 1951, all of which he attended, having to wait for “resuscitators and inhalators” to arrive from Portland or Saco. “We felt with all the beach area in town and a large number of accidents on Route 1, we should be prepared to take care of any emergency right here, without waiting for outside help,” he said. Of course, Haigis was often called out of his practice almost every time there was a bad car accident, or other serious mishap, so the unit served the dual purpose of lightening his workload. Scarborough’s fire and rescue departments remained governed by the Fireman’s Association and its bylaws until 1982 when it finally became a municipal department, operating under the town charter and administrative code. By that time, annual calls for help reached 1,055. Growth came fast in the 1980s, with a full-time, critical-care technician in 1985, the first full-time captain in 1987, and the first full-time paramedics in 1989. Since 1980, Scarborough has grown in population 171 percent, from 7,000 to 19,000, the number of businesses has quadrupled from 400 to 1,600 and emergency calls have jumped 270 percent, from 1,048 to 3,874. Still, the department has just 23 full-time employees, the balance of the need filled by per diem workers and a rapidly dwindling cadre of call company volunteers. 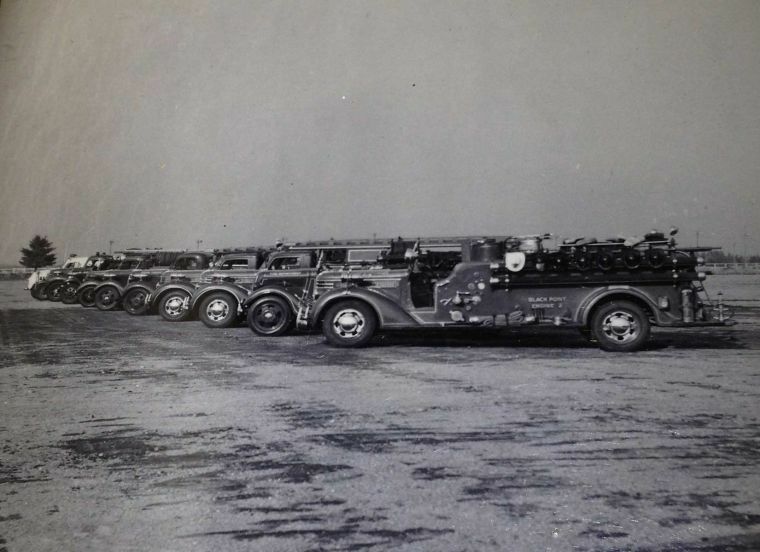 A photo taken in 1954 at Scarborough Downs shows the town’s firefighting fleet, all state-of-the-art vehicles for the era. 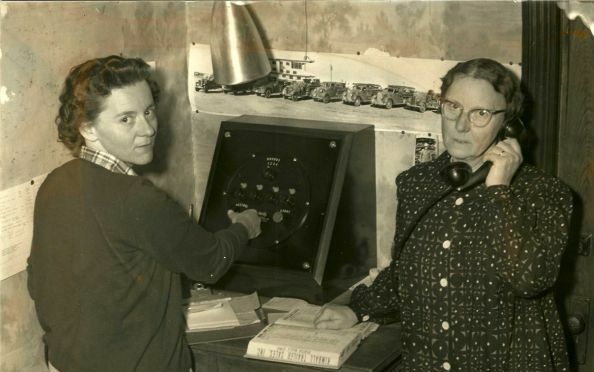 In 1958, Shirley Libby, left, and her mother, Elizabeth, demonstrate what then passed as Scarborough’s emergency dispatch center, which they manned 24/7 in the hallway between their home and the Newcomb store they ran on Black Point.